As DuPage County (finally!) warms up, so do activities at the DuPage County Board. Earlier in March, I had the opportunity to tour the Marklund Philip Center & Day School (Bloomingdale, IL) with Member Sam Tornatore, my colleague who also represents District 1. The residential facility feels warm and home-like, with staff caring for individuals with such compassion and rooms decorated so everyone can feel at home. The staff shared with us the family events they hold so that family members can come and have a fun day with their family members who live at Marklund. While I don’t have children myself, I could only imagine how comforted families must feel when their families find a caring home at Marklund. The educational side was not only innovative but the facilities for students who do not live at Marklund really showed how collaboration between government agencies and local organizations can help us find the best outcomes. Students from surrounding school districts can go to Marklund for the help they need, and then return to their home districts. I loved that the classrooms and hallways looked just like any other school – desks, posters on the walls, even lockers. We even got to meet a child who was completing her last day at Marklund’s school and was returning to her home district the next day – what a joy to be able to congratulate and encourage her. I was able to share my experience with the full board on March 26th and encouraged them to reach out for a tour of this facility – we should all be proud that DuPage County has this amazing resource right at home. In March, the county board also considered the question of whether County Board meetings should begin with an invocation. This discussion and topic was difficult, but I am happy we discussed it. I thought it might be helpful to explain my views on the invocation, why I voted the way I did, and how you can help make our invocations more inclusive. I am one of the millennial non-religiously affiliated folks that many of our public comment speakers mentioned. I grew up in Wheaton, IL where many of my closest childhood friends, their parents, and adult mentors have a strong faith and I couldn’t respect them more. Truthfully, some of my colleagues who spoke about why the invocation is important to them and their faith, were also very moving and challenged me to think about my position in a different way. I do not doubt any of my colleague’s expressions of their faith or their words about why this agenda item is of value for them, I found it informative and I was grateful for their candor. Attending a meeting of your County Board should be comfortable and welcoming – there should be no physical or situational barriers to your entry. It’s your meeting after all, we all work for you. Expressions of faith in invocations can be welcoming, but they can have the opposite effect. In DuPage County’s past, they’ve been predominately expressions of one faith and some felt they were too close to religious expression than an open welcome. That is why I oppose invocations – I do not want to create a situation where someone would take time out of their Tuesday mornings to come see their elected officials only to be uncomfortable when a prayer is offered right at the start of the meeting. Much like how my colleagues of faith expressed why these invocations are important for them, I hope they can consider this other reaction to the same event – both are valid reactions, they just depend on your personal world view. After our vote, the invocation will remain part of our agendas, so we now have to think about how we can achieve the goal of making these invocations more welcoming, diverse, and open to all. One item I think will help is an internal business practice – I offered to help our Chairman by writing language for a welcome letter for our invocation speakers. The purpose of this welcome letter is to thank our speakers for joining us while also reminding them that the room is full of believers and non-believers alike of many faiths, just like our county, and that messages should be welcoming to all. I greatly appreciate the Chairman Cronin’s willingness to explore and implement this small solution. The other way we can achieve this goal is with some help from YOU – we need more speakers! If you have a faith leader who inspires you with messages of inclusion and community, please send them along to me so I can get them invited to join us (my email is ashley.selmon@dupageco.org). I would also LOVE to have more humanist, agnostic, or atheist speakers so be sure to send them along as well. Like I said above, this conversation was very difficult and unfortunately, it was not always respectful. This won’t be the only issue that we tackle over the next four years that is difficult, but I hope future conversations can have more respect for our colleagues when we speak. We do our residents a disservice when we make arguments that are personal attacks or in bad faith and it cheapens our positions when we use these tactics. I certainly disagree with my colleagues – from both parties – from time to time, but I work very hard to not let the emotion of disagreement drive my responses, spoken or in writing. It’s not easy, and I am sure I will not always live up to that standard, but I will always try – and I challenge my colleagues, of both parties, to do the same. Our residents deserve nothing less. In April two items have been my focus: Animal Services and Wood Dale/Route 83. On the April 9th agenda, we had a contract for $45K to review for a fundraising feasibility study for Animal Services. While I am not on the animal services committee, my professional expertise is in philanthropic strategic planning, so I had some questions about this contract. Since then (we pulled it from the agenda to further explore it), I’ve worked with Animal Services to re-evaluate our needs and what resources we already have and we’re working together to see how we can do a study (I am fully supportive of solid planning before taking on a big project like raising money for a capital campaign!) while using the resources of Animal Services most frugally. We have some follow up meetings scheduled and will hopefully have a cost-savings plan to present soon. I will also be meeting with Aldermen from Wood Dale soon to discuss some concerns with Route 83 – municipality and county cooperation is so important and I look forward to meeting with them to find some solutions. If you’re celebrating this weekend, I wish you a happy and restful Passover and Easter! DuPage County needs you (yes, you!) to apply to serve your county on various boards and agencies. The county relies on community members to serve on these committees and they can be a great opportunity to give back. 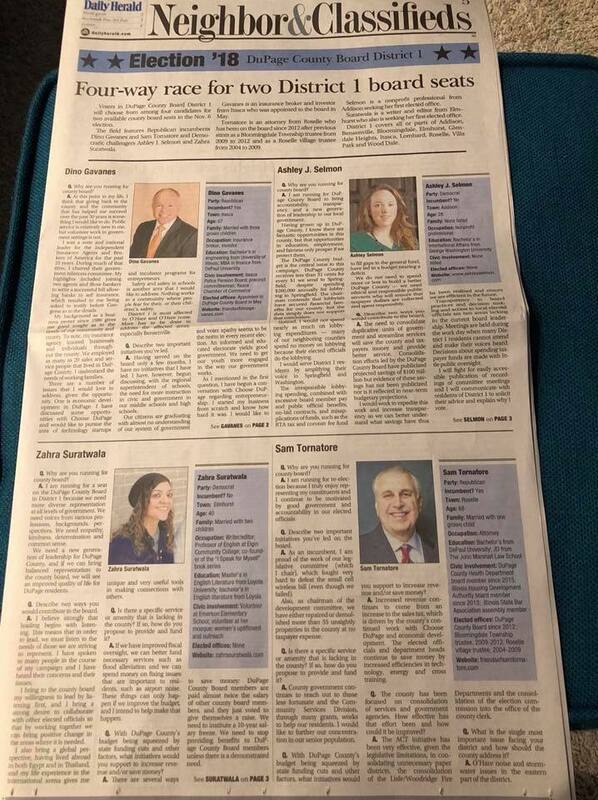 Since joining the board, I have been careful to watch who our county appoints to these positions — individuals should be chosen based on their qualifications and passion. I’ve spoken up when members vote to appoint individuals who have made political contributions, especially when those contributions are to the chairman or current sitting members. One way to end this practice is to continue to draw attention to it and to work with community partners to find solutions through an improved ethics ordinance. Another, quicker way, is for you to apply to serve on these bodies yourself. One of my favorite leaders, Jason Kander, has advice for those who look around at their political leaders — locally or nationally — and are disappointed by what they see. He tells them to “grab an oar” and get to work yourself. Use your skills, talents, time, and passions — whatever they may be — to help make your community a little better. Ready to grab an oar? Apply to serve DuPage County HERE. Hello everyone! I hope you’re staying warm this winter! The County’s public work’s team has been busy making sure the county buildings and county roads are ready for travel, even during the harshest weather. They’re such an impressive, hard working team. On February 4th, I attended a town hall in Itasca with Congressman Raja Krishnamoorthi. It was a great opportunity to hear from the Congressman and what he’s working on, particularly given his critical roles on the House Oversight and Intelligence Committees. I greatly enjoyed the questions asked by all those who attended which covered many issues: immigration, national economy, veterans support, climate change, term limits for Congress, health care, LGBTQ+ rights, balance of powers between the branches of government, the Mueller investigation, the electoral college, the affects of the government shutdown, Alzheimer’s research, gun regulations and background checks, and national security. Afterwards, I had the opportunity to speak with his staff about a Housing and Urban Development issue (HUD) which led to the opportunity to set up a meeting for county staff to meet with the Congressman’s staff in Washington, DC. I look forward to continuing to build these partnerships with our state-level and national-level representatives to advocate for DuPage County. February 5 was a busy day of committee meetings. I began the morning with the Environmental committee where we discussed many issues, including the latex paint recycling program. Member Chaplin, who chairs this committee, shared the budget challenges surrounding this popular recycling program. With staff and committee members, we discussed some possible alternative funding sources, options to make the event revenue generating, and other partnerships, such as with businesses or the Forest Preserve District. I am looking forward to an update on these options. February 12 was another day of committee and board meetings. The first meeting of the day was the Finance Committee where I noticed there was an abnormal edit to a vendor’s ethics disclosure form. I was able to ask county staff to get us some clarification on this edit — I did not suspect any improper actions, I wanted to make sure we were making the best choices with all of the information. County staff was able to update us in between meetings and we approved this important contract with the caveat that our state’s attorney will review the final explanation from the vendor. I am proud of the county staff’s efforts and quick action to not only explain the edit in the forms to us and ensure the taxpayer’s funds are being protected. I ended the day with a meeting with Addison Mayor, Richard Veenstra. As a resident of Addison, it was a great opportunity to meet my mayor, as well as discuss issues of importance between Addison and DuPage County. I had the opportunity to tour the Addison Consolidated Dispatch Center. This impressive facility is a great example of communities working together to make sure we are providing excellent services for the bests costs. A full room for the Congressman’s town hall meeting in Itasca. Happy New Year! The two weeks since we have been back from the holidays have been busy! I began Tuesday morning, January 8, meeting with county staff to prepare for my chair position on the Public Transit committee. Public transportation is a challenge in DuPage County, however, it's not a unique one. Many of our fellow communities have similar challenges: funding challenges, raising customer costs, growing demand for car-less travel options. I look forward to learning what has brought success to other communities and exploring how to bring those solutions to DuPage County. If you have questions, suggestions, or neat ideas about public transit in DuPage County, please send them to ashley.selmon@dupageco.org. Next was the environmental committee. We received updates on some of the county's most successful recycling programs, including paper shredding partnerships. DuPage County partners with local cities and villages to provide in-town recycling events. These partnerships have increased the amount of materials saved from landfills and allow municipalities to offer these events at a reduced cost. We also received an updated to the Sterogenics situation in the southern part of the County. I admire Member Chaplin's leadership on this issue and look forward to the County's continued advocacy for its residents. I also look forward to continued updates from the Illinois EPA and further testing results from the US EPA (note: results from the US EPA are delayed due to the Federal government shutdown.) I then attended the executive committee for the Community Development Committee. This committee demonstrated the rigor and dedication County staff provide to the community grants process. Saturday (1/12) I attended a discussion of the impact of the Federal government shutdown, hosted by Congressman Sean Casten (D, IL-06) at the DuPage Health Department in Wheaton. You can read the Congressman's summary of the impacts felt in DuPage County and resources available here. What struck me most is how the most vulnerable in our communities are already being impacted by this reckless and unnecessary shutdown as well as how the impact can be felt by otherwise financially comfortable families as well. Potential delays in the processing of Federal tax refunds will compound this issue and our community partner's capacity to assist will be stretched to their limits. It also appears to me that there will be a significant increase in the impacts of this shutdown as we near the end of January (if, of course, our leaders in Washington have not reopened our government by then). I personally asked Congressman Casten to keep the hardships experienced by federal contract workers in the discussion of legislation to re-open our government. I, and my fellow board members, am very grateful to Congressman Casten on keeping us all informed. Tuesday January 15, I attended the finance committee, my first meeting as a member of the technology committee, and the County Board meeting. There were two troubling votes during the County Board meeting that I want to explain. The first was the vote to consolidate the Election Commission into the Clerk's office. What the board members disagreed on was the timing -- every member wanted to consolidate the election commission, which as been plagued with significant issues. What the Clerk herself, County staff, and the public told us -- clearly and with evidence -- was that consolidating in January was not a wise choice. The reasons for this could not be clearer. There was no plan developed by the previous Clerk between March 20 (the day DuPage County residents voiced their clear support for this consolidation) and the end of his term. Clerk Kaczmarek was sworn in in December 2018. No one having an honest conversation about the logistics of this change would tell you that a brand new executive should lead a massive consolidation effort after 6 weeks on the job -- let alone when that body is in the middle of operating an election. Let alone when there is no plan, significant (20%) staffing issues in the affected offices, and no budget allocated to make this change. I was proud to vote against this political decision and to stand and speak for logic and good governance. I believe Clerk Kaczmarek will execute this election to the best of her abilities, I simply wish the County Board had made an honest effort to set her -- and thus all residents of DuPage County -- up for success. The second vote that is concerning was the vote we took to appoint various residents to boards. Far too many of these candidates, again, are political donors to sitting board members. The most egregious example of this was one appointee who gave a member of the DuPage County Board $5K on December 11, 2018 -- after the election. As I stated during the meeting, I do not know how our residents can look at that vote and think anything other than the seat was bought. I firmly believe DuPage County is full of highly skilled and highly educated professionals and volunteers who would cherish the opportunity to serve their county. They should not have to donate to an elected official to serve their county. I reminded the Chairman and Vice Chairman that they’d promised to look into expanding the ethics portion of the application process. I will continue reminding them until they take this necessary action. Lastly, tonight I attended a presentation for county and municipal leaders by Metra in Glen Ellyn. As the new chair of the Public Transit committee, I'm very grateful for the opportunity to attend this event and to hear from Metra leadership about their accomplishments and significant challenges. Metra's success and safety is essential to the livability and economic development of District 1 and all of DuPage County; I look forward to working with them and commuters. I will not be able to attend committee meetings next week, unfortunately. I will be out of town on a trip that was planned before election day. I will read the materials provided as to not miss the content. Last week's board meeting - and happy holidays! Before we all settle in to celebrate the holidays and the end of 2018, I wanted to cover last week's board meetings. Last Tuesday (12/11), I attended the finance committee and the county board meeting -- both meetings are represented by all 18 members. The full board meeting was the longest and most eventful. This meeting had a few DuPage County residents speak during public comment -- I want to thank all the residents who attended to draw our attention to issues affecting them and their neighbors. We also had an opportunity to welcome and thank students from District 1! Students and teachers from Fisher Elementary and Emerson Elementary attended and we thanked them for participating in a program called Cool Yule which utilizes recycled materials to decorate the county buildings. If you're in the county building before the end of the year, stop by and see their handy work! The first vote of the full county board meeting I want to discuss is the vote on the committee assignments. I had a very open minded approach to the committee assignments. We received a copy on paper at orientation of the proposed committees and another in our emails with updates to that draft. I was pleasantly surprised to see that Democrats, including myself, were assigned chairs. I also noticed that the assignments were pretty significantly different than the original drafts but I found the committees I was on interesting and well-suited for me to represent the concerns residents raised to me during the campaign. I further noticed that some of the committees which move significant amounts of the budget through them were not chaired by Democrats and the representation was more skewed in comparison to many of the other committees.My colleagues raised these concerns as well as a concern that if the goal in assignments was to match experience, strengths, and passion, it would follow that Member DeSart, who had prior elected experience, would have been selected for a chair. I think all of these issues were important to raise and to discuss publicly so that residents could understand our votes. For the reasons outlines by my colleagues Member Chaplin and Member DeSart, I voted no on the committee assignments. The second vote I want to discuss is my vote on the nominee for the Ethics Commission. As I spoke about during the meeting, I did not find the information included in the packet materials sufficient enough to evaluate this candidate. This is especially true when evaluating someone who will be overseeing our conduct -- they should be someone who is not connected to any of us. I found that the nominee had donated to various local campaigns -- Republicans and Democrats -- so this is not a partisan issue. This is an issue of transparency and making sure we are choosing the absolute best candidates, without any conflicts, to serve our County. I appreciated that Chairman Cronin and Vice Chairman Zay agreed to explore what further information about political activities could be included in these applications. I then voted no for the nominee. One thing I am most proud of following our first meeting, is that despite the discussion becoming fiery at times, each Democratic member voted their conscience. We all discussed the need to end one party rule and return thoughtful debate to the County Board during our campaigns. We all promised our voters that we would be an independent voice and be educated about the issues and transparent about our reasons. We did that in our first meeting. I can't think of a better way to end 2018. I hope you all enjoy some relaxation and pleasant company over this holiday season. I will be spending lots of quality time with my friends and family. Board committee meetings are cancelled for 12/17 and will resume in January. First week serving District 1! What an amazing first week serving District 1! The week kicked off Monday when I was sworn in for my four year term on the DuPage County Board. The evening was a great celebration of public service, with many volunteers and supporters joining us for the Inauguration Ceremony. I was honored to have my oath of office administered by the Honorable C. Stanley Austin (retired). To me, he has always been "Mr. Austin." He was my speech coach throughout my high school career at Wheaton North High School. His support and mentorship in high school and beyond made him my first choice for the evening's ceremonies and I was grateful he agreed to join me. Bright and early the next morning, we all got right to work. I began the morning attending the Stormwater Committee meeting, observing the judicial/public safety committee, and attending the Public Works Committee. I found them all quite interesting. The Stormwater Committee includes county board members and mayors from the towns we represent -- this is a great opportunity for cooperation across all of our units of government. I especially enjoyed the presentation at the Public Works Committee which outlined their plans for improvement and modernization over the next twenty years. This comprehensive planning is difficult but so necessary to allowing the county to make the best financial decisions going forward. I look forward to hearing more during the next meeting. Tuesday evening, I met with an Addison family to hear some of their concerns. I look forward to working with that family, and all District 1 residents, throughout my term. The Honorable C. Stanley Austin (retired) before I took the Oath of Office. Join me on Sunday at the League of Women Voters of Elmhurst Candidate Forum. See the event details here. Yesterday’s Daily Herald featured some familiar faces- me and Zahra Suratwala! A. I am running for DuPage County Board to bring accountability, transparency, and a new generation of leadership to our local government. Having grown up in DuPage County, I know there are fantastic opportunities in this county, but that opportunities in education, employment, and fairness only prosper if we protect them. The DuPage County budget is the central issue to this campaign. DuPage County receives less than 31 cents for every $1 we send to Springfield, despite spending $260,000 annually for lobbying in Springfield. The chairman contends that lobbyists have secured financial benefits for our county, but the data simply does not support that conclusion. Instead, I would not spend nearly as much on lobbying expenditures — many of our neighboring counties spend no money on lobbying because their elected officials do the lobbying. I would serve District 1 residents by amplifying their voice in Springfield and Washington. The irresponsible lobbying spending, combined with excessive board member pay and public official benefits, no-bid contracts, and misapplications of funds, such as the RTA tax and coroner fee fund to fill gaps in the general fund, have led to a budget nearing a deficit. We do not need to spend more or less to build a better DuPage County — we need ethical and responsible public servants who will ensure that taxpayer dollars are collected and spent responsibly. A. The need to consolidate duplicative units of government and streamline services will save the county and taxpayers money and provide better service. Consolidation efforts led by the DuPage County Board have publicized projected savings of $100 million but evidence of these savings has not been publicized nor is it reflected in near-term budgetary projections. I would work to expedite this work and increase transparency so we can better understand what savings have thus far been realized and ensure we are efficient in the future. Transparency in board practices and decision making and access to local elected officials are two areas lacking in the current board leadership. Meetings are held during the work day when many District 1 residents cannot attend and make their voices heard. Decisions about spending taxpayer funds are made with little public oversight. I will fight for easily accessible publication of recordings of committee meetings and I will communicate with residents of District 1 to solicit their advice and explain why I vote. A. DuPage County is not dedicating enough resources to the opioid epidemic, flood alleviation, and O’Hare noise complaints. Funding for these important issues could be secured through expediting the consolidation efforts, increasing transparency and scrutiny of contracts, and reducing excessive benefits for elected officials. Q. With DuPage County’s budget being squeezed by state funding cuts and other factors, what initiatives would you support to increase revenue and/or save money? A. As discussed in other answers, there are various areas of “low-hanging fruit” that can save taxpayers money. This includes: a pay freeze for DuPage County Board members lasting 10 years. Public servants should be compensated, but our excessive pay must be frozen. We can further cut unnecessary health benefits for part-time board members, most of whom use taxpayer-funded benefits rather than the benefits offered by their full-time employers. Reduced lobbying costs and further consolidation efforts are also areas for savings. Looking into the future, we must look for new revenue that is not reliant on sales taxes to balance our revenue streams. Working with towns within DuPage County and in the collar counties to draw green jobs and tech-friendly industries such as data storage facilities will grow our tax base while also expanding job opportunities to DuPage County residents. A. While the county must continue and accelerate its efforts throughout the county, we must do more to reduce spending. The efficient consolidation of the election commission into the clerk’s office must continue and be a transparent process. Another area of consolidation that should be explored is abolishing the recorder’s office. As a county, we should examine why we have an office that is not required by the Illinois Constitution and that our fellow collar counties have eliminated without reductions in services. To improve these two specific cases, transparency around planning and cost savings must be increased to county residents. The $100 million figure discussed by the county is a projection; the data supporting that conclusion is not publicly available. These issues, and any others, must also be considered with urgency, not simply reviewed during election years with action delayed until it is politically helpful for the ruling party. A. Fixing the county’s current budgetary problems and planning more strategically for our financial future would allow us to build a better DuPage. Less budgetary constraints would allow the DuPage County Board to encourage economic development in DuPage County, increase tax revenues that do not fall on the backs of residents, fund innovative solutions to the opioid crisis, address flooding concerns and O’Hare noise, and many other concerns. Let's Build a Better DuPage! Meeting Juliana Stratton in Elmhurst! 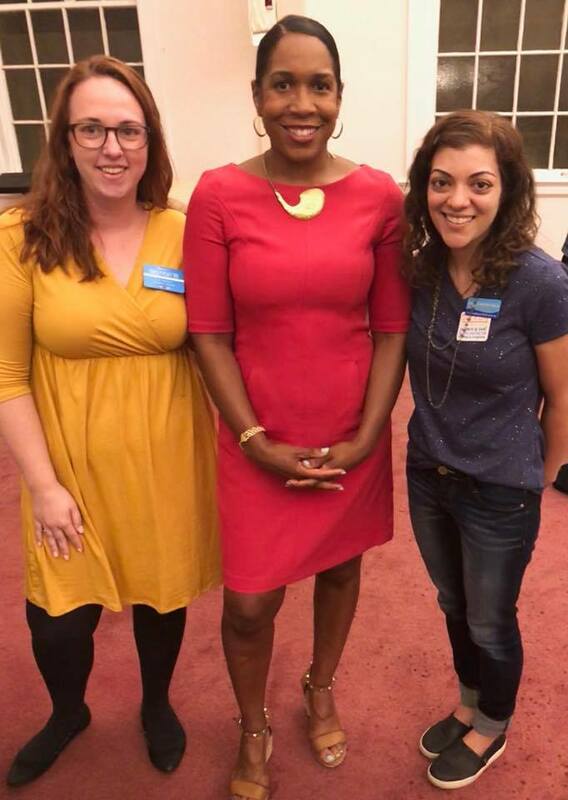 Tonight Zahra Suratwala and I had the opportunity to hear Juliana Stratton speak at the monthly meeting of Progressives for Change in Elmhurst. Hearing Juliana speak about the spirit of public service and listening to communities was so inspiring!